This will be our first virtual planning session; we are really embracing our new technologies skills. This way it can be opened up to anyone who wants to comment or anyone who wants to just listen in. So I had an idea and it was oddly even before the snow started…. Living in Britain it is quite common to wake up and the second thing out of our mouths after “Morning darling” is “What’s the weather like?” It is something that everyone takes an interest in, from a passing observation to a life’s work. It affects what we do as well as how we feel. The learning on this subject is endless. It is constant and ever changing. So I would like to give the children the opportunity to get interested in the weather, record it, predict it and enjoy it. This theme has huge potential for growth. It is scientific, analytical, social and emotional. I envisage a weather station in the outdoor space, a group of resources that the children can use. These resources could be used for organised activities as well as free choice play. 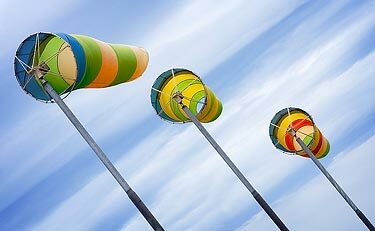 We could have crystals to check for sunlight reflections, wind socks/mills to check wind direction and strength. Cloud catcher nets and rainfall measurers. This collection of resources can be added to over time and different parts will be used more at different times of the year. There are so many activities that could spring from this, scientific experiments/measurements, wind power/ solar power, seasons, flora and fauna. The children can give feedback on their discoveries, they could pretend to be a weather man/girl and present their forecast. It could even become part of the daily routine. Christine and Anne-Marie can you tell what weather related things you already do? Are you happy for me to develop this idea? As always I love to hear everyone’s thoughts or ideas….